with your teacher controlling them (e.g. during reading groups). There are hundreds of free and paid apps that contain either animated stories, picture books with attached narration or even interactive stories. The Fantastic Flying Books of Mr Morris Lessmore is a wonderful app that blurs the line between a picture book and animated film. 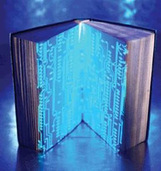 It contains an interactive story where you can interact with the digital content within the story. 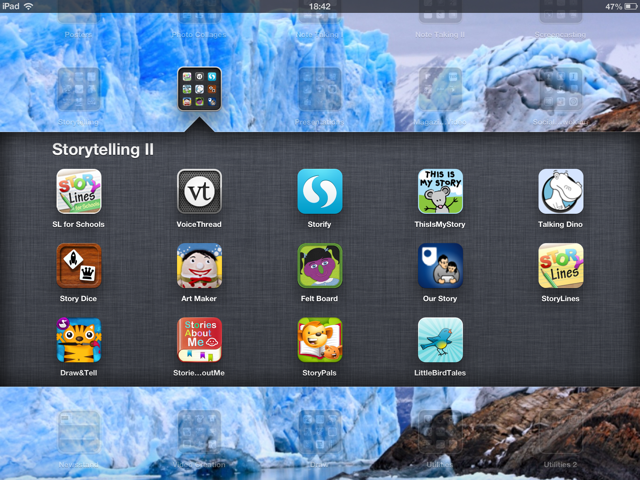 Kidorama Storytime (iOS - free and paid) is a whole different type of interactive story app. The app enables young readers and family to interact with each other, even when they are in different locations anywhere in the world. Watch the video below to see it in action! As shown in the video above, two people with iOS devices can read, video chat and interact with the same ebook(s) together no matter where they are in the world. Readers can sit next to each other or call each other. Storypanda has a wide selection of titles, including a Storypanda app (that contains multiple Storypanda titles) and individual Storypanda titles in app form . 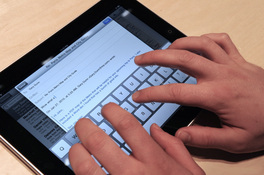 Augmented texts are paper-based texts that become interactive when combined with the use of an augmented reality app. 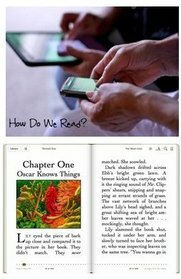 show animations even when the book is being read by other students and being held at a distance away from the iPad/iPhone camera. Watch the videos below to see how it works! The Fantastic Flying Books of Mr. Morris Lessmore Imag•N•O•Tron Teaser (Now with Story-O-Scope) from Moonbot Studios on Vimeo. See the IMAG·N·O·TRON in action! from Moonbot Studios on Vimeo. Marvel comics has also created an AR app to bring their paper-based comics alive! Download Marvel's AR App (iOS | Android) to make their AR paper-based comics come to life! 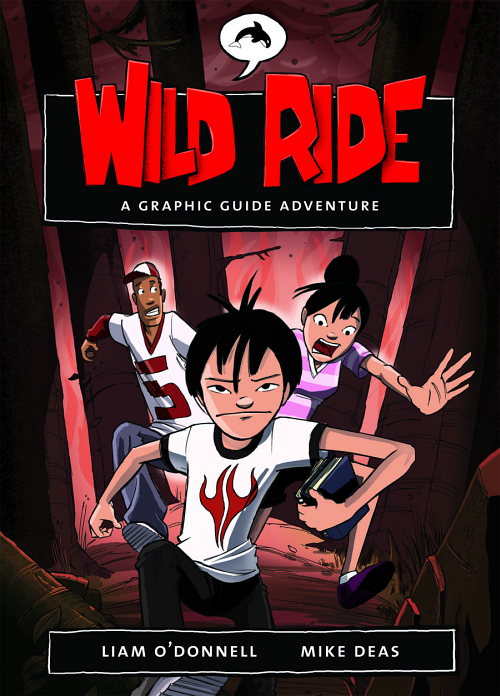 There are a wide variety of online providers of digital comics and graphic novels. Each of these providers require the creation of an account to purchase or download free comics and novels. 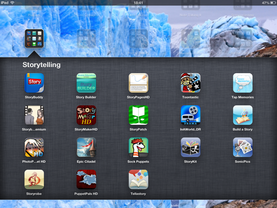 Pictured below are various other eBook story apps for iOS devices. Right-click on either image to download and view the names of the various apps. There are thousands of short movies/digital stories available freely available on YouTube. Click here to access one such story and look at all the other short animated videos that are listed on the right hand side of the YouTube window. 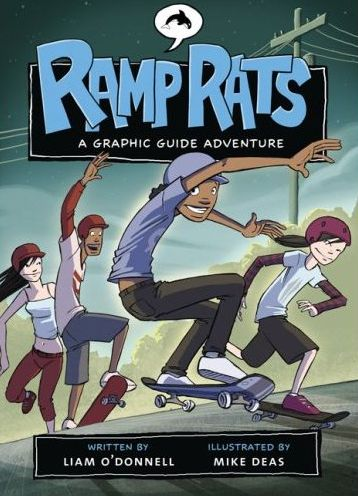 There are plenty of free and subscription websites that have animated stories or picture books with attached narration. Oxford Owl provides a selection of leveled classic tales read by professional storytellers for free. Storytime Online has free videos of famous books read aloud by actors, with added music tracks and sounds! Check out Betty White reading 'Harry the Dirty Dog' by Gene Zion! If your school has blocked you from using YouTube, you can can click the “Select Player” button on the top-left of the screen and select either My VR Spot or SchoolTube, then all your videos will be played on the player you select. There are three free online eBooks to help you learn about cybersmart education. You can select 'Read It Myself' or 'Read It To Me'. You can also download PDF versions of each eBook. Speakaboos has a wide variety of animated speaking books and songs. You can access the Speakaboos website (to access five free books per electronic device) or download the Speakaboos app for iOS (three free stories). ABC's Reading Eggs has a wide variety of leveled books for junior years studnets to help them learn sounds, sight-words and comprehension skills. Check out the sample lessons here. Once parents subscribe, students can access Reading Eggs lessons via Windows/Mac/iPad or Android devices. 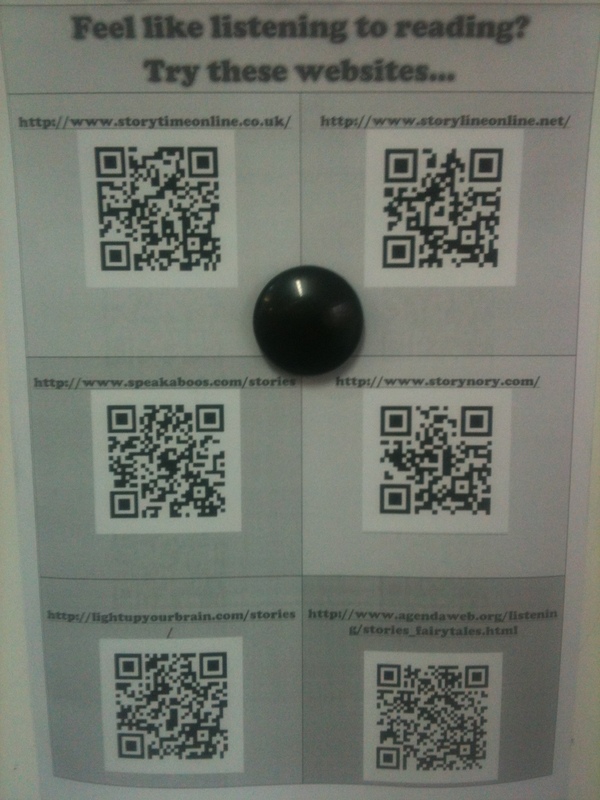 the QR codes above with a QR Code reader to access various digital storytelling websites. You can also download two such classroom posters here (1 | 2). You (with your parents permission) can also purchase eBooks from online book stores to read on eReaders, smartphones and tablets. Some eBooks purchased from an online store can be used on multiple devices such as PC, phone or tablet (e.g. 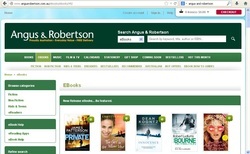 Angus & Robertson, Google Play Books or iTunes) or be linked to a specific device such an eBook reader (e.g. Kobo Reader or Kindle by Amazon). 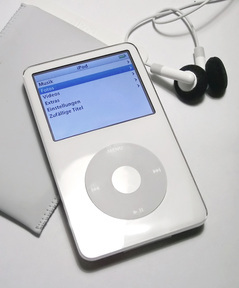 Audiobooks have some advantages over paper-based books and ebooks and you don't have to read anything and you can listen to the story while moving around (e.g. exercising or doing jobs around the house). There are many online audio book suppliers, some are free and others are paid services. Read below to learn more about some popular audio book providers. Audioboo is a free service that hosts online conversations that you can (i) listen to and (ii) upload your own audiobooks. Check out Audioboo for Education or the free apps for iOS and Android. Audible by Amazon is a paid service that contains over 800 titles for children aged 0-4, over 4000 titles for ages 5-7 and over 5000 for ages 8+. Every time you read you are exposed to rich vocabulary that you could use when you are writing. Either during or after reading, you should monitor and collect examples of words that are either related to the characters, settings, themes or events or that are excellent uses of descriptive writing. There are two free websites that allow you to create wonderful displays of these great word choices: (i) Tagxedo and (ii) Wordle. Tagxedo can be useful if you wish to display the author's use of vocabulary in the form of a shape or object related to the characters, settings, themes or events contained within a book. Ensure that Microsoft Silverlight is installed on the PC (Windows or Mac). Under the 'Options Menu' click on the arrow next to the word 'Shape' to (i) select from a variety of given shape layouts or (ii) to browse the computer for an object/shape by clicking on 'Add Image'. At the top of the Tagxedo window click 'Load...' to type or paste in the desired vocabulary. Save the word cloud by clicking 'Save | Share ...' and selecting the desired option. 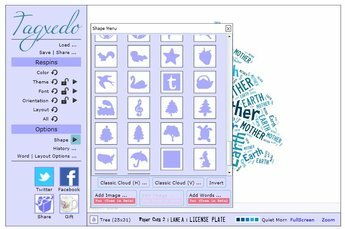 Wordle is another free web service to quickly and easily create word clouds. However, work can only be saved by taking a screenshot of the work. Type or paste in the desired words. Press the PrintScreen button on a PC's keyboard and then paste the image into any paint or Office program or if you are using an iOS or Android device take a screenshot. Crop the image and then save. A screenshot from Super Mario Bros.: The Lost Levels (NES) & Wii Virtual Console. 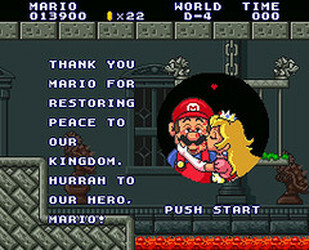 If you talk with your parents about the video games they played when they were younger, they may discuss that the main female character always seemed to be in needing of rescue from the main male character! 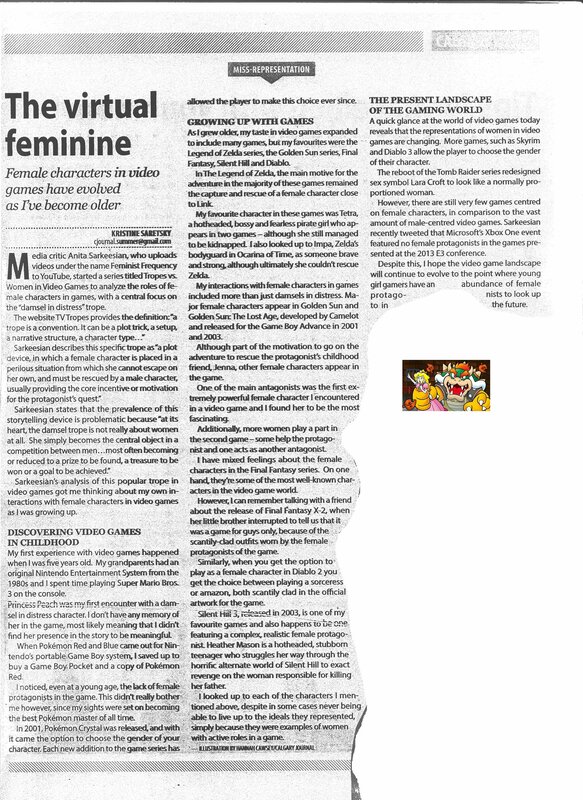 Read the wonderful article titled, 'The Virtual Feminine' (online edition, scanned copy) written by Kristine Saretsky, which analyses the roles of female protagonists (main characters) in video games. The article raises an important gender issue. In the article, Kristine discusses her memory of video games growing up as a child of the 80s and how she noticed the lack of proper female protagonists and how there was a damsel in distress in most games. The video games you have played. 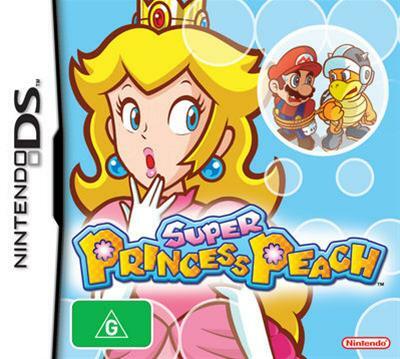 Which video games allow you to choose to play as either a female or male character (i.e. Pokemon or Mario Kart). Settings and how the settings impact upon the mood of the storyline/game. 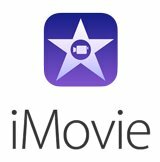 iMovie on the iPad and Mac provides you with an option to create a trailer from an existing or new video using easy to use templates and musical scores. The Minuscules TV series is a wonderful as it has no words, and instead focuses on visuals and sounds. It is also ideal for giving you chances to practice the reading comprehension skills that will help you to become a better reader and viewer. Find a skill below and follow the instructions! Sequencing is being able to put things in order, which is a basic skill to help you understand and read/viewed text. What insect was catapulted first/second/next/last? What happened after the ladybug figured out that the grasshopper was responsible for catapulting the other insects? ﻿Synthesising is a reading skill whereby you monitor how your thinking changes as you are reading/viewing (e.g. 'Oh, that's why the character was angry!'). Read a paragraph or page or view part of a video. Think about what you have read/viewed. It can help to take down notes about how your thinking has developed or changed when reading using a Synthesising Snowman. What actually happened? Was your prediction correct? What were your original thoughts about how you could describe the character of the ladybug? How and why have they changed? What did you see? What did the ladybug do? Who's perspective was the camera angle/shot viewed from? What made you think that? What assumptions could you make when comparing the flying skills of the ladybug to that of the flies? What connections could you make between the scenes depicted in the videos and movies that you have watched? (The fly chase scene and the lead fly crashing and falling apart can be compared to the pod racing scenes and crashes contained in Star Wars: Episode 1). It's important that you learn how to analyse and understand music so that you can make appropriate choices when choosing the types of music that you listen to. Their attitude towards something or someone (what they are feeling). What they value or what they think you should value. What they believe or what they think you should believe. Or what they think, or what they think you should think (attitudes). Identify the difference between values, attitudes and beliefs. Identify which songs that you share/do not share the same values, attitudes and beliefs with and why. Make an informed decision for yourself and others as to whether you should listen to or play a song given various circumstances. What values can be present in songs? What attitudes can be present in songs? What beliefs can be present in songs? What values are normally present in hip-hop/rap/R&B? What attitudes towards women are normally present in hip-hop/rap/R&B? What beliefs about money/fame are normally present in hip-hop/rap/R&B? What does this song possibly tell us about the songwriter's/singer's values/attitudes/beliefs? What were some interesting word choices made when the song writer wrote the song? The music video for 30 Seconds to Mars' Closer to the Edge is one of the most powerful songs and video productions aimed directly at children. With a partner (friend or parent) watch the music video below in full screen mode, with the lights turned off, the speakers (and bass) cranked up and then try to answer the questions below. If you have trouble answering any of the following questions then watch the video again, and again, and again! As you start to tune into the lyrics, the visual clues and the on screen captions, you will eventually be able to unpack the whole song. Then watch it one more time and then discuss the final discussion questions (far below). What are the names of the band members? Why were their baby photos used? Why did you get to see each band member doing some outdoor activity by themselves? What was the song about? / What was the message of the song? What does it mean to be 'closer to the edge'? The edge of what? Why are they signing 'I'm not saying I'm sorry'? Is it a dangerous attitude to be saying you're not be sorry? What were the values discussed in the song? What were the attitudes towards .... discussed in the song? What were the beliefs of (the band / the children) discussed in the song? What values (if any) from the song do you agree with? Why? What attitudes (if any) from the song do you agree with? Why? What beliefs (if any) from the song do you agree with? Why? What does 'Into The Wild' mean? Have you ever seen a music video that flashes words up on the screen? Why do you think the video producer chose to do this? Did the video clip enhance the meaning of the song? If so how? Did the video try to persuade you to feel/believe? If so, what? How? Who are the believers? What do they believe? What is a cult? Who is part of the cult ('Yes this is a cult'?)? Why would the lead singer use a pseudonym? Who wishes that they were in the crowd at one of the concerts? Why? In what part of the song did you get the most goosebumps / emotional? Why? What trade occurs in this song/story/poem? What are the poet's values/attitudes/beliefs? Who do you know that? Why do you think the man needs a dollar? What story could he be sharing, to have you, in return, share your dollars with him? If someone said to you that, "I think that the man in Aloe Blacc's song is a young man named Mr Wendal? ", how could they have come up with such an idea? What was the other song we listened to, where a person gave his money to someone in need? (Mr Wendal by Arrested Development) What other donation strategy did the person who wrote Mr Wendal use? ('He gives me some knowledge, I buy him some shoes'). What is better, a hand out or a helping hand? What is the difference? John Mayer - Waiting For The World To Change. Did the music/instrumental help set any imagery? How? Why? Is this song written about the past, present or future? What makes you think that? Who in the song do you think were the 'kings and queens of promise'? What could we do where it got to the point for someone to write this song in 100 years time to then sing/pen 'we were the victims of ourselves'? If your school, teachers or students have iPads, Android tablets or Macs, long gone should be the days of students publishing their writing by hand or by using the Microsoft Office Suite. Read below to see why and how students should be publishing their writing in the form of eBooks. You can open eBooks on a wide variety of devices (i.e. phones, tablets, eBook readers, PC, etc. ), email or upload them to share them with others. You can even add eBooks into your school interactive ePortfolios. Curious? Here's a free download a student's eBook of a narrative (open in iBooks on IOS devices, BookReader on Mac, Moon+Reader on Android or Adobe Digital Editions Windows/Mac). eBooks (ePub and PDF files) and audio eBooks can be uploaded to a School iTunes account (check out Podcasts @ Berwick Lodge PS - iTunes | Website) , allowing for the school to collate a collection of student work that is downloadable by the school community (learn how here). your ebooks and audio tracks can then be stored in an interactive ePortfolios. where the future of publishing lies (watch the video below). See the eBook creating apps below to find a solution that meets your needs. Description: Perfect for creating eBooks with multiple chapters. Easily insert images and headings. For lengthy texts, it is best to type the work using Windows or Mac, email it to oneself, open the email on the IOS device and paste into CBB. Watch the official CBB video tutorials here. Price: Free or upgrade for $5.49 (Book Creator is available with a 50% discount for bulk purchases under Apple’s Volume Purchase Program). Description: One of the free eBook creators that can be trialled and then be upgraded to the full version if users find it useful. Learn more here and access a step-by-step guide to creating your first eBook here. Description: A simple online eBook creator for the junior years classroom, containing six themed character templates. Simply select an element, drag and drop, resize and resposition and type in the text boxes. Augmented tests occur when you combine a paper-based text with augmented reality. To augment your texts, you can use a combination of avatars, videos and still images discussed here. Just because you're a kid doesn't mean that you can't publish your work professionally! The low cost of using online companies to publish photo books and posters really gives schools, students and parents the opportunity to create professional looking work! See the various ideas below for more details. Anyone can create and publish a photo book (using SnapFish.com.au). Perhaps you could create one for a younger sibling or for a Prep buddy! 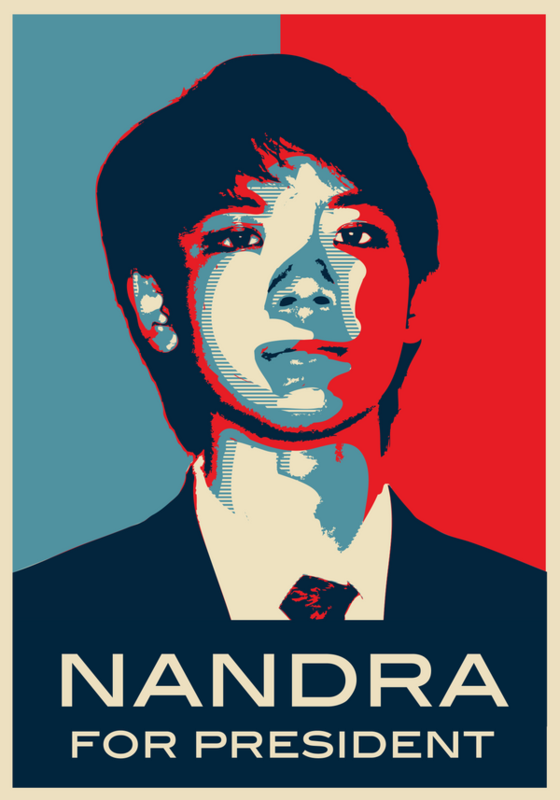 Why use a home or school printer when anyone can professionally publish their digital work(s) in the form of very large, high quality, glossy posters using SnapFish.com.au? The process is as easy as uploading a digital image and placing an order! 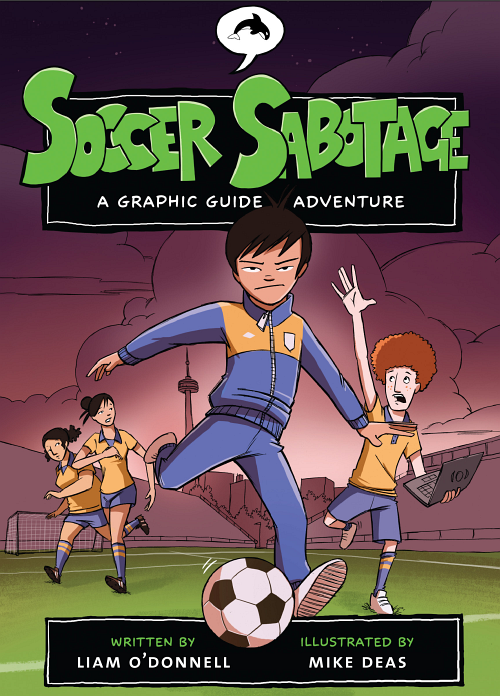 Wanting to transform your written narratives into comics? Use a combination of the apps below to create professional looking comics on a platforms. Price: Free for home use and paid for school use. 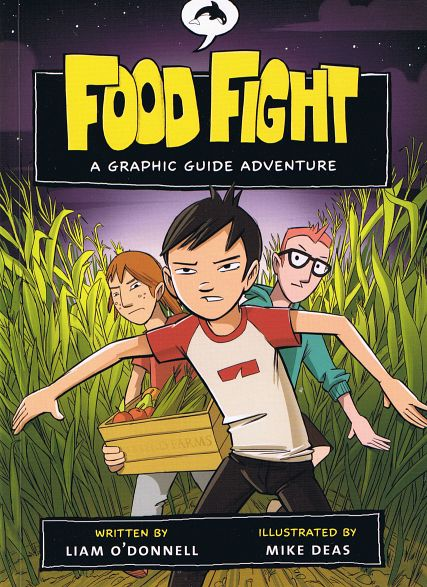 Description: A great online comic creation tool making comics an easy task! Description: Create professional looking comics using templates, characters, speech bubbles and art galleries. Watch the official video to learn more. Description: Create professional looking comics using customised speech bubbles, page layouts, import images from library and camera roll (be the star in your own comic) and manipulate images using various image filters. Saves to PDF. Watch the official video to learn more. Price: $1.99* Add-ons available for purchase. Turn off in-app purchases in the iPad Settings menu to disable purchases. Price: Free* Add-ons available for purchase. Turn off in-app purchases in the iPad Settings menu to disable student purchases. Description: Create comic and scrap books with camera roll images. Choose a page layout, apply photo filters, position captions, add speech and thought balloons, mix in a few sound effects, and share a creation as an image, multi-page document, or high-definition video. Use the following apps to create professionally filmed news reports. i-Prompt Pro is a free app for iOS & Android designed to assist you to practice the real-life skills of reading the news whilst looking at the camera. Once you have typed your news script into the app, you can increase or decrease the speed of the teleprompter to assist you with developing a suitable pace of speech. You should also combine the use of the teleprompter app with some paper-based notes to replicate the experiences of a real television news studio. When you are ready to film, one student should film using any video recording device, whilst another should hold the iOS or Android device that the i-Prompt Pro script is on above the video camera so that the news reader can both read and look at the camera at the same time. 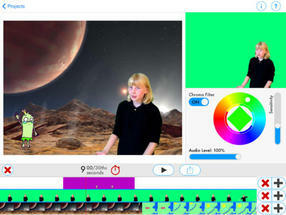 Green Screen by DoInk is allows anyone to film professional video as if they were using expensive computer equipment and a green screen. All you need to do is use to any one-coloured wall or cloth as the background and then adjust the 'Chroma Filter' to that colour (as shown in the image above and the video below. iMovie (iOS | Mac) allows you to film and then edit news reports. You can also import videos from the camera roll (such as those filmed using the Green Screen app reviewed above) or an external source via an adapter (following these steps). Once you have used the editing tools to ensure that your video flows correctly, you can also add music, sounds and select template tools to create professional sounding news reports. Websites are great tools for organising, presenting and sharing your information report with a large audience, making you work accessible to your extended family and potentially to a global audience. With a wide variety of free website hosts, who provide users with easy to use drag and drop templates, even the youngest of students can easily create and/or maintain a website. Click on the images below to visit student websites showing their information reports. You can make an information reports interesting by using a combination of narration and images (e.g. using PowerPoint or Pages). Watch the video below to view a student's history project about Japanese Geisha. Digital Storytelling Exemplar from Connect Charter School on Vimeo. Ever seen those cartoon videos that explain how something works and wondered if you could make them for free? Well know you can with two easy-to-use online services:. Want to use PowToons? Click here to register for free! Want to use Moovly? Click here to register for free! 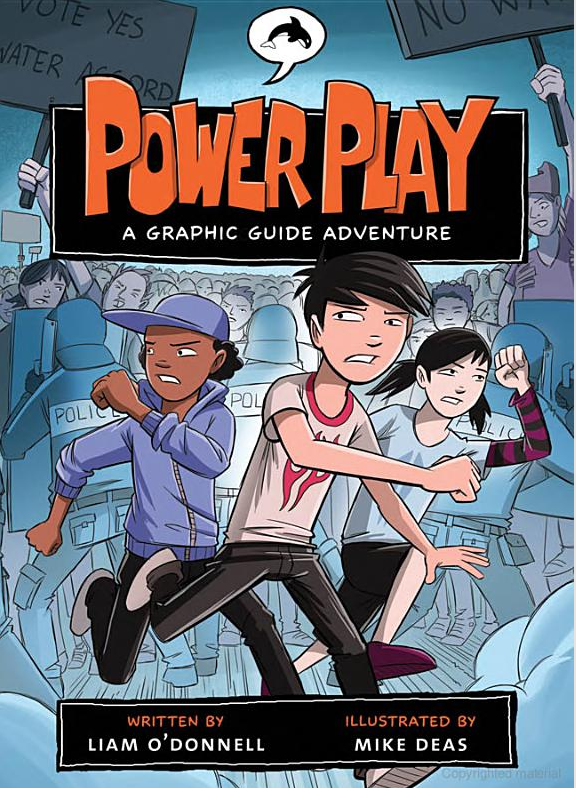 Play A Video Game Whilst Learning How To Argue/Write A Persuasive Text! Learning how to create a persuasive argument can be tricky. But what is you could learn how whilst playing a video game? Now you can! Mars Gen One: Argubot Academy (Edu: Free, Personal: $2.99) is a role playing game for iPad that is based around a mission to populate the planet Mars. Your task is to use argubots to explore a series of missions that grapple with key issues facing the Martian colonists. Players learn the art of using argubots, arming them with argument cores and then engage in special argument duels. Argubot Academy Overview from GlassLab on Vimeo. Placing QR codes on handwritten pieces of work can allow your to add multi-modal content to your work. Seen in the image below are student written poems that have been turned into pieces of art that reflect the main idea and theme of each poem. 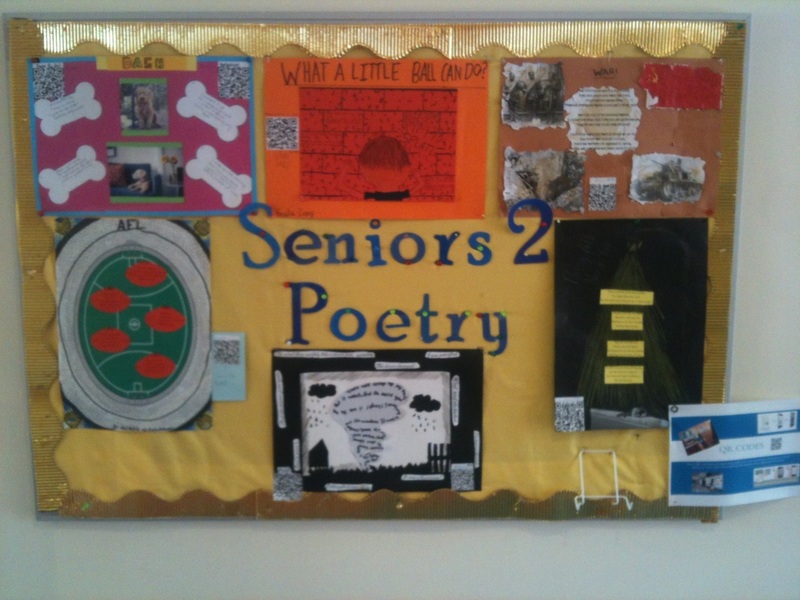 To further bring these poems alive, the students have placed QR codes on them, each linked to an online video of the students (i) reciting their poem and (ii) reflecting on their poem's design process. Therefore as parents and other members of the school community walk past the poems, they can read them, view them as visual pieces of art and then pull out their smartphone or tablet to scan each QR code to then have the student read them the poem and explain how them created their poem too! Create any content and upload it onto the internet (to an online/cloud storage place such as a Google Drive) or find any content on the internet. Get the hyperlink to the content. Use a QR code generator. Scan the QR code using a QR reader on a smartphone, tablet or webcam device. Place the QR code on your work. Write how large the file is underneath the QR code so that people who are going to scan it know how many megabytes they are about to download when they view your digital work. It is important that you develop your note-taking skills so that you can quickly capture information that is being read aloud by your teacher, a podcast or video. ABC's Behind the News (BtN) is a review the week's top news stories both in Australia and from abroad presented in a child-friendly manner. In this digital age it it important that you learn how to keep safe whilst using the internet. Watch the videos and take notes about what you learn. P.S. The answers for the Game section can be downloaded from here. In 'Despicable Me', Felonius Gru reads the story 'Three Little Kittens' to the children. Watch the video below and then scroll down to learn how this adorable story can be used to inspire the creative presentation of your writing. Shorten the length of your story and use easier words. Make the content of your story interactive and more engaging (e.g. by creating finger-puppet books, pop-up books or interactive eBooks). If you have younger siblings or cousins, the following resources may help them learn to read and write! Ziptales' Learn The ABC teaches children the alphabet. Module 2 allows students to click on any particular letter of the alphabet to learn or review. select from a series of silhouetted objects the silhouette of those objects that start with the focus letter. 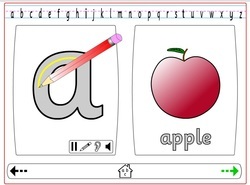 Learn The ABC can be used on a Windows PC or Mac, Android device or Chromebook. As it is a Flash object, if you wish to use it on an iOS devices such as iPads and iPods you will need to use Puffin Browser. Ziptales offers free trials for 30 days by clicking here. Various subscription prices exist for parents, schools and teachers. Click here to find the subscription that is right for you. Endless Alphabet is a cute app and fun app to teach young children the letters of the alphabet. The app reinforces letter sounds within a context in a humourous way. Endless Alphabet is available for both Android (free) and iOS ($AU8.99) devices. This handy Flash object reviews the sound of each letter of the alphabet, how to correctly write each letter and a letter to word association. Users can navigate forwards or backwards to any letter of the alphabet. Access the Flash object here. AR Flashcards - Alphabet (iOS | Android) is a simple and free AR app that brings a specially designed set of alphabet flashcards to life using animated 3D animals and letter sounds. 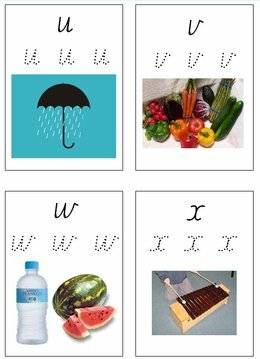 Download the PDF containing the physical flashcards/target images here. Watch the video below to see the app in action. rED Writing is a paid ($AU3.79) iOS app that is designed to help young children learn to handwrite letters using the Australian letter formations (fonts). Users simply select their state (to load the necessary fonts) and then are prompted to trace the given letter or number using their finger. Users must start at the correct starting point (as shown in the demonstration) otherwise their finger stroke will be deemed invalid. Once users correctly form/trace each letter three times they are rewarded by earning estickers (which they can collect). Numberlys is a part motion picture, part video game app for iPhone and iPad, created by the team behind the highly popular 'The Fantastic Flying Book Of Mr Morris Lessmore'. 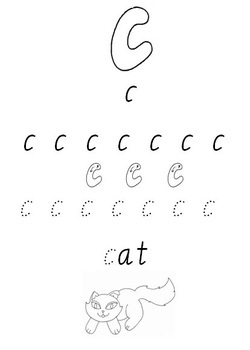 At school, children are taught to write using dotted-thirds with joined and unjoined writing. The Victoria government provide downloadable fonts for Windows and Mac. Close any Microsoft Office programs that are open on a PC/Mac. 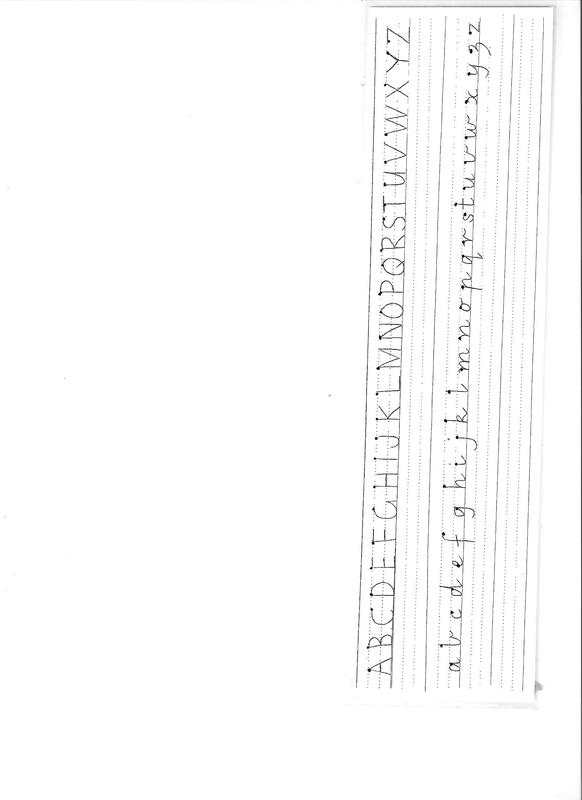 Download the Victorian Modern Cursive Script font files here. Select all the files, right-click one the selected files and then select 'Install'. Downloadable alphabet models othat demonstrate joined and unjoined scripts for both left- and right-handers are also available here. This fabulous book can only be ordered online but can help a child to learn how to read and write their own name. 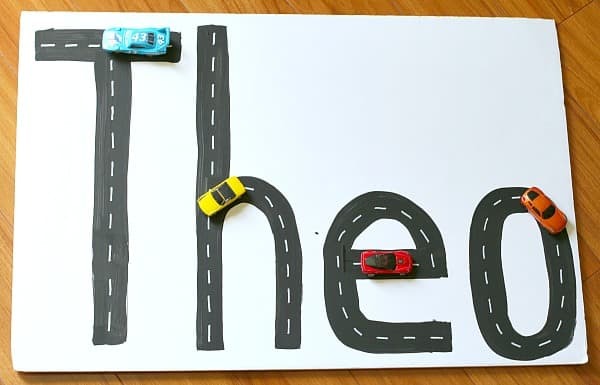 Use the resources above with this arts and craft activity (created by Buggy and Buddy) that use a child's love of toy cars cars to help them learn how to write their name by learning the correct starting point and direction. Image © 2014 Buggy and Buddy. All rights reserved. Do you have electronic tablets or smartphones in your classroom? If you have an electronic presentation or document to show your class, instead of only displaying it on an interactive whiteboard or via a projector, you can send it to each student's screen and control what they see! Conference Pad allows a person to control a presentation on up to fifteen iPads, iPhones, and iPod Touches from a device, simultaneously and wirelessly over Bluetooth or Wi-Fi as well as on one or more external screens or projectors attached to iPads and iPhones. Smoothboard Air allows you to broadcast a Windows PC screen onto other people's tablets, smartphones, laptops or PCs. Watch the video below. Install Microsoft .NET Framework 3.5 SP1 on the Windows PC (download it here). Install the Smoothboard Air Server on the Windows PC. Run Smoothboard on the Windows PC. 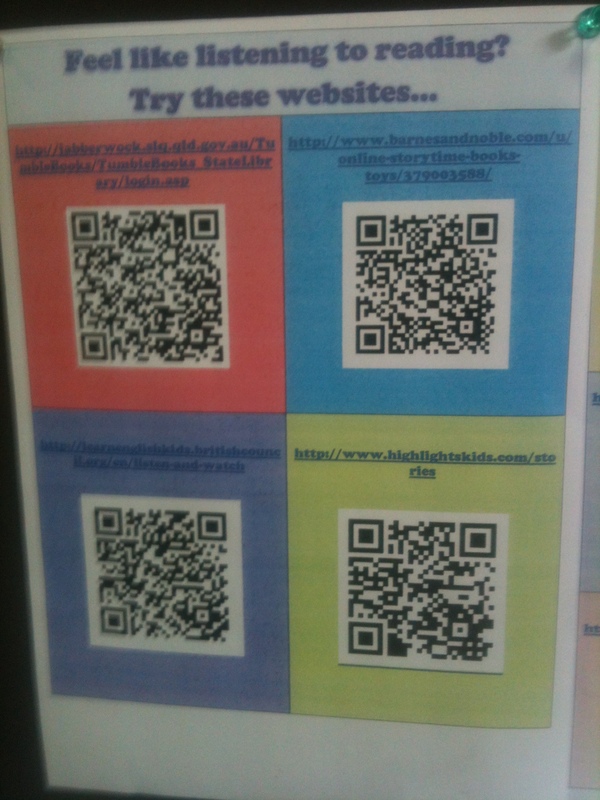 If the students are using an iOS or Android device: Install a QR Code Reader app on each device. Scan the QR Code from the PC's monitor/Projector using a QR Code Reader app is installed on any iOS or Android device. If the students are using a PC or laptop they must open up an internet browser and type in the IP address given in step 3. Access a wide-variety of presentations created by the Nearpod community. Get engaged with Nearpod from Nearpod on Vimeo. Register for a free account at the Nearpod website. Login to your Nearpod account using either a Windows/Mac/iPad/Android device. Create or upload the presentation. Add interactive polls, quizzes, videos, etc. Download the Nearpod app on any iOS or Android device. Others must open the Nearpod app on their device and enter in the PIN given to them by you to access the presentation. Each person who signs in is added to a 'class list' on your account. AirServer, for Windows 7/8 & Mac, allows you to mirror and stream content from an iPad or iPhone onto Windows or Mac. You can also record the iOS screen. See the video below for further details. Install a copy of AirServer onto a Windows/Mac PC. Double click the circle button any iPad. Select the name of the Windows/Mac PC. Reflector (for Windows XP/7/8 & Mac) allows you to mirror and stream content from an iPad or iPhone onto Windows or Mac. You can also record the iOS screen and can simultaneously display multiple iOS devices on the one Windows/Mac screen. Download a trial (32-bit or 64 bit) or click here to purchase and download Reflector.